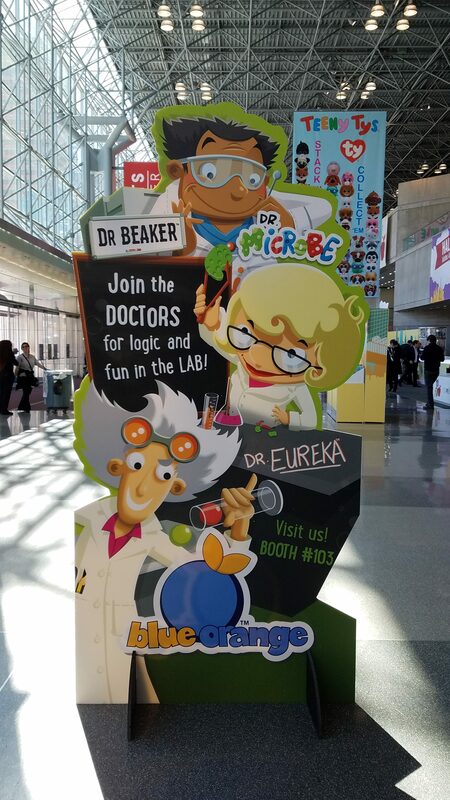 Dr. Eureka was a big hit for Blue Orange in 2017. 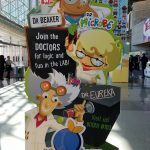 The games company has expanded the line with two new science-themed puzzle games, Dr. Beaker (April, $20) and Dr. 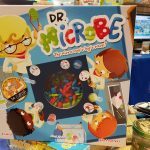 Microbe (just released, $20). 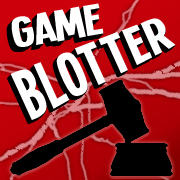 Both games are shipping to stores this week. 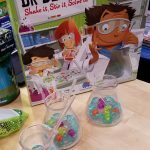 Dr. Beaker comes with four plastic Erlenmeyer flasks (not beakers) and plastic stir bars. 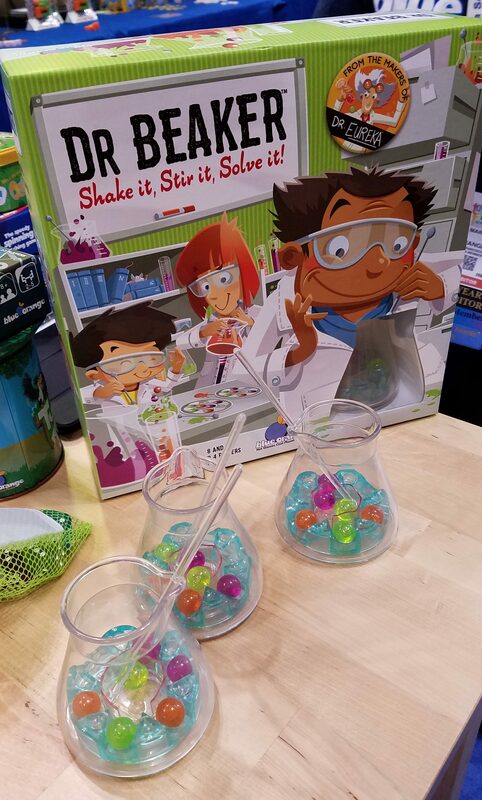 At the bottom of the flask is a rotating ring with six colored marbles and an empty middle space; players race to match the pattern on a challenge card by rotating the ring with their stir bar, moving the “molecules” around. In Dr. 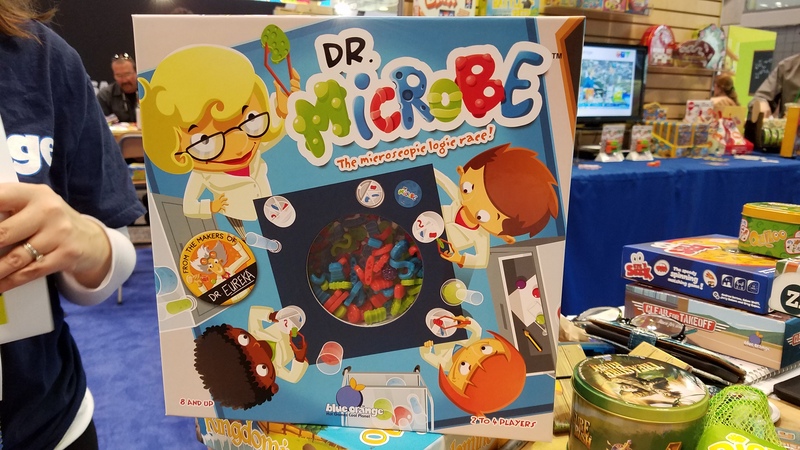 Microbe, each player has a mini-petri dishes divided into sections and a big tweezer to pluck microbes pieces from a central petri dish. 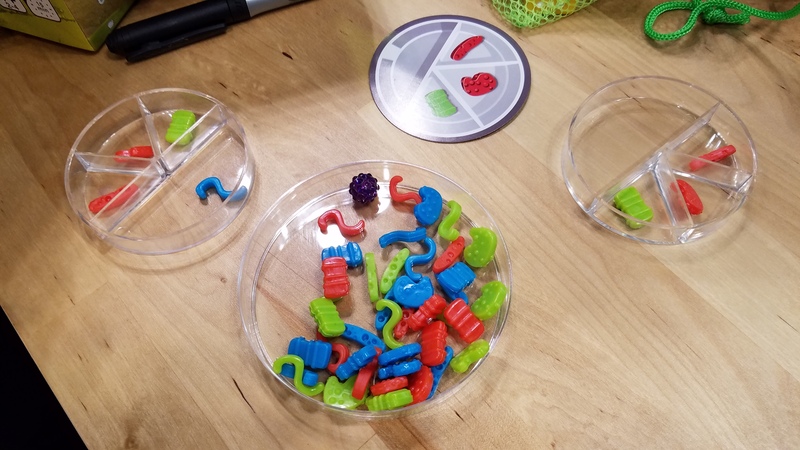 A challenge card is flipped over showing three different microbes; players use the tweezers to place those into their dishes, then find the one that doesn’t match any of the three microbe’s colors or shapes. 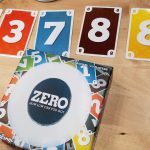 Zero (just shipped!, $10) is a card game where you’re trying to get the lowest score in your hand of nine cards by trading cards from a central tableau. 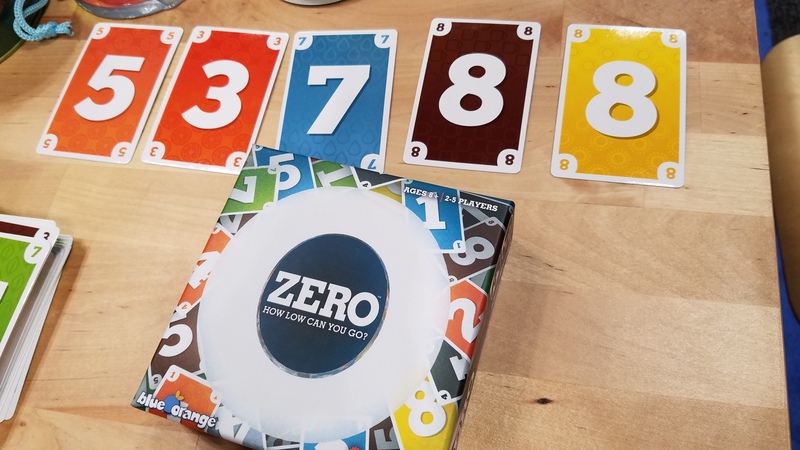 When the game is over, each rank is worth only one card of that number, so if you happen to wind up with all seven 6s, that’s just six points. 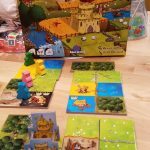 Kingdomino (just shipped, $18) is a tile-laying game where you’re creating a 5×5 grid of terrain-themed dominoes around your castle. The really clever thing about this is how players choose domino tiles. Each is numbered from 1 to 48 on the back. In a four-player game, four are drawn and placed in numerical order. Four more are placed in a column next to it. 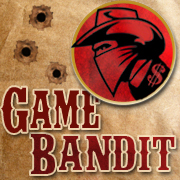 Players choose which tiles they want, with more valuable tiles coming lower in the stack. 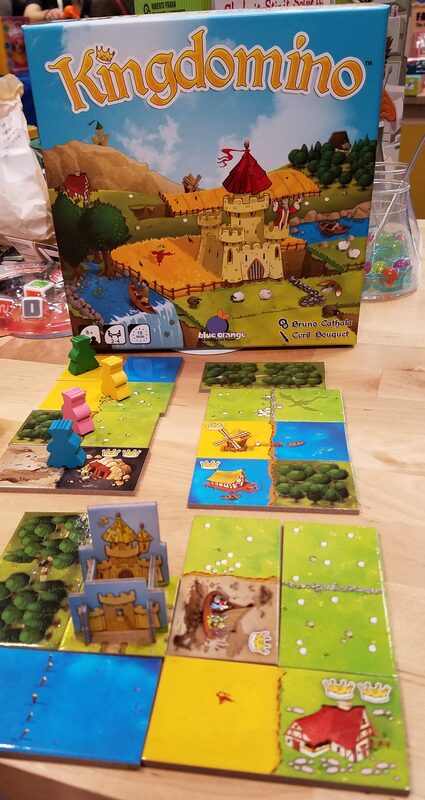 The next turn, the order for choosing tiles is based on the previous turn’s order: you chose a low-scoring tile first? 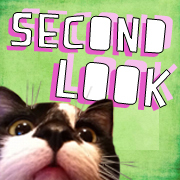 You have your pick of the next four. Choose that last one that’s worth a lot of points? You’re taking whatever is left over next round. 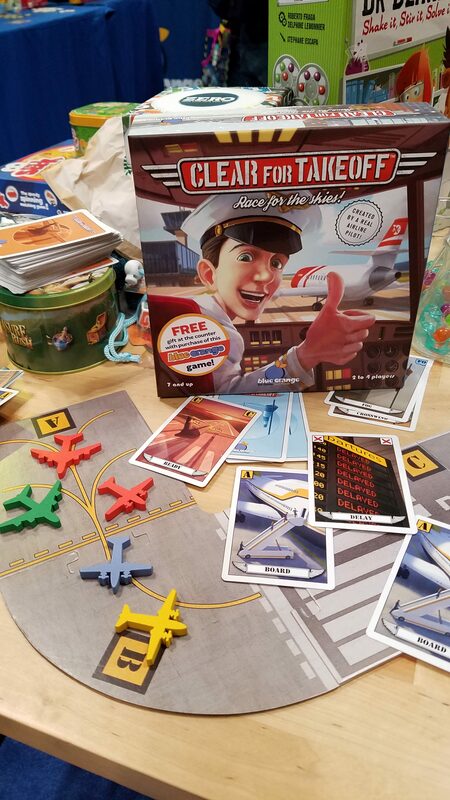 Designed by a pilot, Cleared for Takeoff (just shipped, $16) is a game about getting your fleet of planes off the tarmac and into the sky. 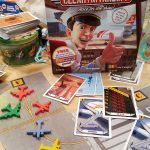 Play matching sets of cards based on the plane you’re trying to advance through the boarding, taxiing, and takeoff process, to get all three of your planes off the ground. 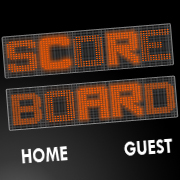 This game seems to have some of Take That-style of play involved. 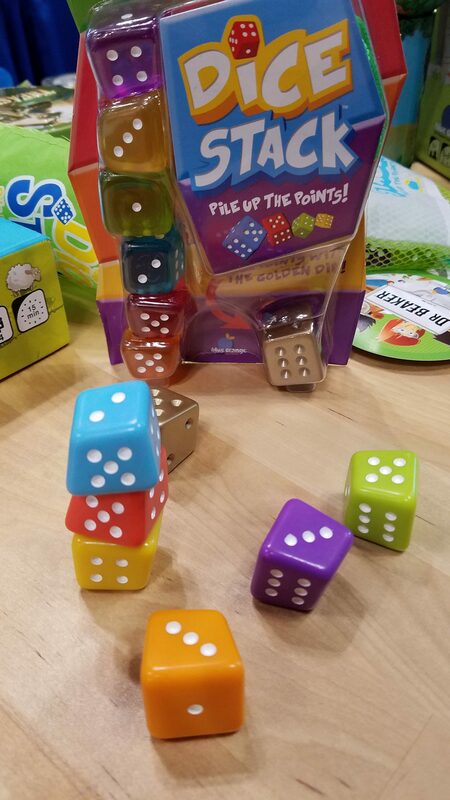 A package of seven oddly-shaped six-sided dice are in Dice Stack (April, $10). The object? Roll and stack them in numberical order. 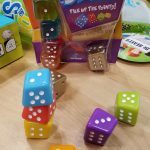 It’s a cute dexterity game that’s easily portable (Dice Stack comes with a drawstring bag for the pieces) and can be played anywhere there is a flat surface, level or not. 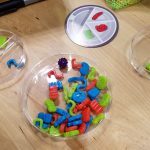 Plus: cool crazy-shaped dice.